When I was eleven, the seldom-used formal dining room of our home in California was my secret refuge. The sliding-glass doors allowed plenty of sunlight into the room, and the prayers I said near them would come to brighten my life. I discovered the dining room as my place of introspection. Sometimes, while my sister and brother played outside, I was intent on staying inside to ponder the meaning of life. I wanted to know who I was and what I was meant to do. But God seemed so distant. How could I find Him? How could I possibly know Him? Though immensely important to me, the whole proposition seemed unattainable. I had concluded that God would have to be close to me to answer my pleas, but I doubted He was. That doubt brought urgency and hopelessness to my prayers. I don’t know where I came upon the term “absolute truth”; neither my parents nor the nuns in my school used it. But it was my term for referring to an unknown reality. Whoever was hearing my prayers needed to know that I was looking for a complete understanding of the truth. I had conceived that this absolute truth would be found in books of knowledge, and in my prayers I regularly asked to come in contact with those books. I so strongly desired getting those books that I even envisioned touching and opening them. Just a few years later, I held the books of His Divine Grace A.C. Bhaktivedanta Swami Prabhupada. Here were English translations of books that had guided spiritual seekers for thousands of years. I understood that I had come in contact with the Absolute Truth. As I’d promised in my prayers, I dedicated myself to understanding the truth, taking up bhakti-yoga as taught by Srila Prabhupada. As a new devotee of Lord Krishna, it seemed that every month a handsome volume of this ancient literature would be published, newly translated by Srila Prabhupada. I had an incessant flow of knowledge about the Absolute Truth, and I soaked it up with more relish than those soothing rays of sunlight in my dining room. My favorite books were the Caitanya-caritamrita series—an amazing blend of rigorous philosophy and theology and a recounting of the life of Sri Krishna Caitanya Mahaprabhu, the incarnation of God for this age. Because Sanatana’s questions echoed mine, Caitanya Mahaprabhu’s answers became very important: God Himself was about to answer me. Everything comes from the energy of Krishna, the Supreme Personality of Godhead, Lord Caitanya told Sanatana Gosvami. 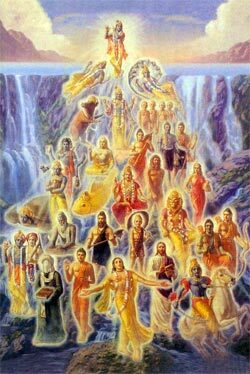 All living entities are created by the Lord and are His eternal servants. They sometimes forget this fact, but by again awakening to the truth of their spiritual identity they come to serve the Lord in love. To come to the point of serving God, the living entity must become attracted to Him, and that starts with hearing about Him. God is great, and I am small, a servant of a great master. And just how great of a master, Lord Caitanya began to lay out for me. Though there’s no limit to Krishna’s manifestations, Lord Caitanya said that He would briefly mention some. Sri Caitanya Mahaprabhu’s description of Krishna dissolved my childish conclusion that God was distant and inaccessible and brought me an exciting new reality. The sheer amount of information was overwhelming. And so was the message: God is very close to me. He sits with me in my heart. He is in every atom. He is so full of love for us that He repeatedly manifests different forms in the material sphere to teach us lessons, draw our attention, and call us back to Him. He is always attentive to reclaiming us. As I watched the chart take shape, I began to feel the expansive nature of Krishna’s presence and His love for me. The information Lord Caitanya gave Sanatana Gosvami is essential knowledge for all of us. The material world is full of darkness and unlimited miseries. The only way we can become happy is to serve Krishna, the original soul of all living entities. Each soul is part of Krishna, the Supreme Personality of Godhead. 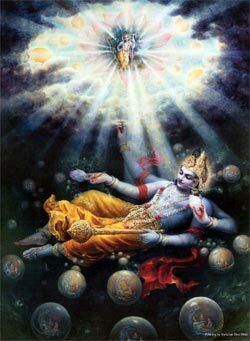 Therefore Krishna is very dear to every living being. Krishna Himself explains in the Bhagavad-gita that the only way to satisfy Him (and, as a result, ourselves) is through devotional service, bhakti-yoga. As I absorbed this information, I was filled with gratitude. Lord Caitanya had answered in explicit detail all my questions about who I was, what I was to do, and the goal of my life. In the process, He had given name and form to the intangible “absolute truth” I was seeking.